Frequent business travelers looking for a simple way to earn travel rewards on everyday business expenses. You earn 1.5 miles per $1 on every purchase with no rewards cap and no expiration on miles - those rewards can add up when you use this card on everyday purchases for your business. 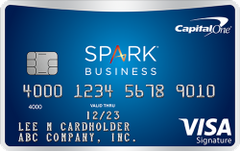 See the full list of top business credit cards.